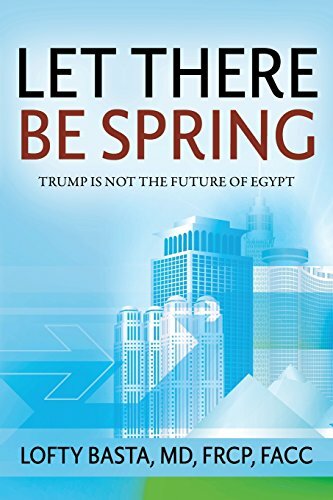 In “Let There Be Spring,” Dr. Lofty Basta provides great insight on the past and current turmoil in Egypt from his standpoint. Born and raised in Egypt, he currently serves as a clinical professor of medicine at UCSF. Although he left Egypt years ago, he still has great interest in what is happening and has happened in his homeland. Since 2011, he has been writing his own thoughts about what has occurred and has given freely his thoughts to past and current leaders of Egypt. His only hope is that Egypt gets out of the funk it is in and moves forward. The author states the problems in Egypt are many. There is no lay leader, no civic institutions, systems, or parties. He believes that Egypt can reform if given a respected leader, and have a strong government and if all people treat each other with respect. This however, will take time, many years in fact. One of the goals as Dr. Basta sees it is to live in harmony, respect different religious beliefs, and treat everyone equally. He also believes that genital mutilation, forced marriages, and the treatment of women as inferior must stop immediately. He relates that women outnumber men in Egypt. Another belief is that anyone who violates the law should go before an impartial court, and if found guilty be punished per the law. This has not been the case in past years, as certain groups and religious entities have been accused of crimes that were not committed. He relates that certain religious groups and “dictator” style leaders only serve their own purpose, and not what is good for Egypt. In the election of 2012, Morsi, who won the presidential race, talked a good game while running for office, but once he was elected he only did what benefited him without regard to others. Basta spends a good deal of time discussing Copts, of which he is one. Copts is an ethno-religious group in Egypt and is the largest Christian denomination. The Copts are fearful, and feel insecure and anxious about their future. After Morsi was elected, it only became worse with increased attacks on Copts, as they were not willing to bow down to religious extremism. There have been numerous rumors that during the election votes were rigged, and that many Egyptians took to the beach or went on holiday and did not vote. One question the author asks numerous times is “Should Copts be involved more, be smarter and more effective, or just criticize, complain or assign blame?” Another theme you hear throughout the book is that women are treated inferiorly, not equal to men, and often are uneducated so they can’t vote. In my opinion, the latter is stated repeatedly to the point you don’t want to hear it anymore. We get the point. He also addresses whether a new constitution should be written, or whether the priority should be to get strong unbiased leadership in place first. I believe the author presented some valid concerns for the people of Egypt and provided some substantive solutions. It did not appear he was lecturing or that he had an “I know better than you” type of attitude. He is very concerned about his homeland and presents his views honestly. His thoughts and organization on points were well done. I found “Let There Be Spring,” Dr. Lofty Basta easy to read, while at the same time providing substantial facts to support his thoughts.